Whilst many people are out and about shopping for pressies, I’ve been busy stitching up some hand made gifts for my Stitching Santa recipitant. Here’s a little sneak preview of some of the gifts which are being sent off to Father Christmas in the morning. 3 of these gifts I’ve made, 2 have been bought. I also have a piece of fabric that I’ve bought, but that’s going to be a surprise! Thanks so much Sheila for organising this, you truly are Wonder Women fitting everything that you do! Love the B&W zip bag. Would you show us how to make them? It looks like it would be a good bag to put in your luggage to keep ones undies in. They’re fab for just anything, and so addictive once you start making them. Here’s a free pattern from Craftsy explaining who to make them. (Much better than I could!) I stopped before the last stage to keep mine flat. It’ll make sense once you read it. What fun! I love the vintage ladies and the graphic prints, and the little flowers, and the bigger floral. OK, apparently I love them all. 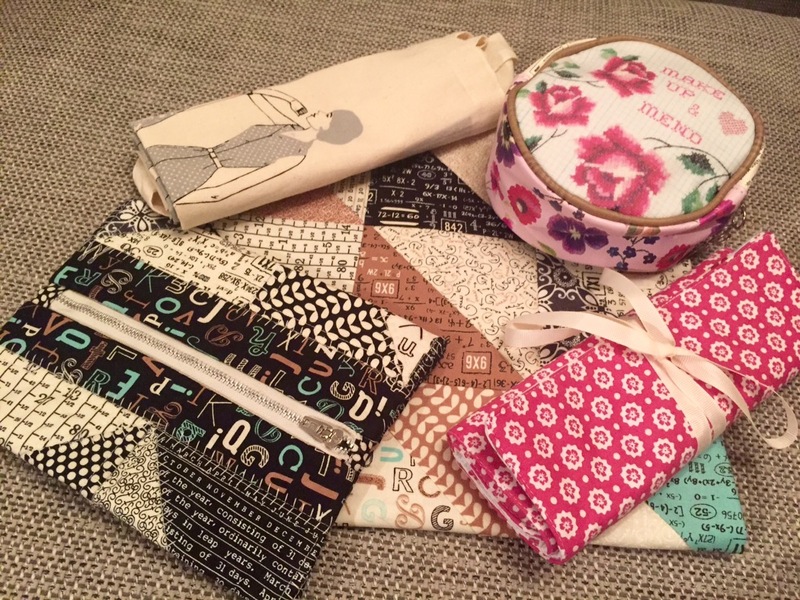 Can’t wait to see how your recipient likes her package and have the details on mystery fabric…..
Just a bit! But then I’m just as bad at getting excited! I love the black, taupe and turquoise together. A lovely little collection. Ooooh you’ve been busy with the patchwork! 😀 I can see lots of numbers and letters there, wondering if it’ll be for a teacher… can’t wait! The zip bag is great, nice prints put together. is it the Craftsy one? Lovely to read all the updates, very exciting!